Box looked the same, just had small fender flares and skinny tires. You have never seen one because they were never made.The first Ford Dually pickup was 1980.The first 4x4 Dually pickup was 1999. They made 4x4 dually's way before 1999. 1976 F350 Dually. very nicely done too! Anyone wanna bet.The first factory Daully pickup was 1980 before `80 they were just cab and chassis no pickup beds.The first 4x4 cab and chassis dually was in 86 and the first 4x4 dually with a pickup bed from the factory was the 99 Superduty.There were Centurion conversions and other companies like Arrow craft who converted single wheel trucks to Duallys .That blue dump in the photo above is a 2wd and that Crew Cab is obviously cobled together from parts from other trucks.The fenders on that crew cab look like the ones from the JC Whitney catalog in the seventies. i bought a brand new F350 4X4 dually in 1988. 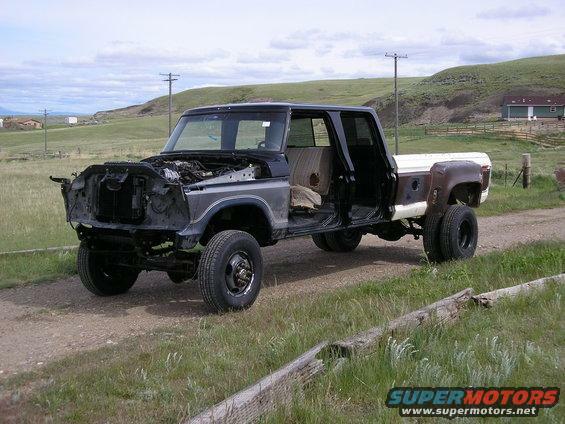 Was it a pickup or a cab and chassis?If it was a pickup it was converted. a friend also ordered 3 2 months after i did for his hot shot company. Please promote "Late 70's dually"